Hugo uses 3D Functional movement developed by the Gray Institute of Functional Exercise Therapy and combines this with Osteopathy treatment to create a highly effective therapeutic programme for you. It enhances the healing process, reduces pain quickly, increases mobility and helps you maintain and improve your own musculoskeletal health. He treats at his own practice conveniently located between central Kingston and Surbiton just 10 mins walk from both train stations in KT1. There is ample parking too. Hugo will video you doing your unique functional exercises (with your permission) so you have a reference after you have left the clinic. You will also have access to his YouTube channel of therapeutic exercises where you will find a range of exercises that you can use in the future. I can not recommend Hugo enough!! He has done wonders for my back. Wherever you have pain, Hugo will always find the cause the of the pain as well as treating the muscle and joint pain itself. It may be in a different are of the body. Neck pain can come from the lower back or even the foot. He takes the time to explain why the pain is occurring. Then through a combination of hands on treatment and specific functional exercises he will help you to reduce the pain and give you the means to address the cause and reduce the risk of it happening again. Would like to know more about Back pain or Frozen shoulder? 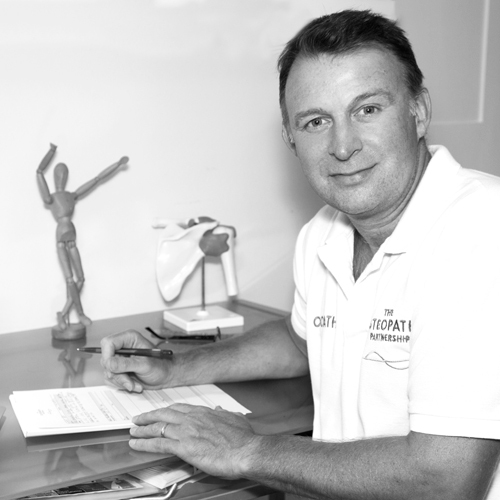 As a sports injury rehab specialist, Hugo will analyse your gait, foot biomechanics, posture and spine as well as the injured tissue itself to find the root cause of the injury if it is a recurring injury or healing very slowly. Recurring injuries such as hamstring strains, achilles tendonitis, plantafascitis, shin splints, ankle sprains, calf strains, runners knee, tennis and golfers elbow, shoulder and knee pain, back pain, sciatica – all benefit from this approach. He provides really effective rehab exercise programmes tailored to their sport that help his patients regain proprioception and muscles strength. So they are ready to return to their activity with less chance of re-injury. The only Osteopath to go to in Kingston/ Surbiton! Hugo's personal and tailored approach really help sort my back out! Hugo was so knowledgeable and professional, it was refreshing! He also provided advice and exercises to help stop it recurring.